The first bunch of Carrots was harvested on May 21, 2018. 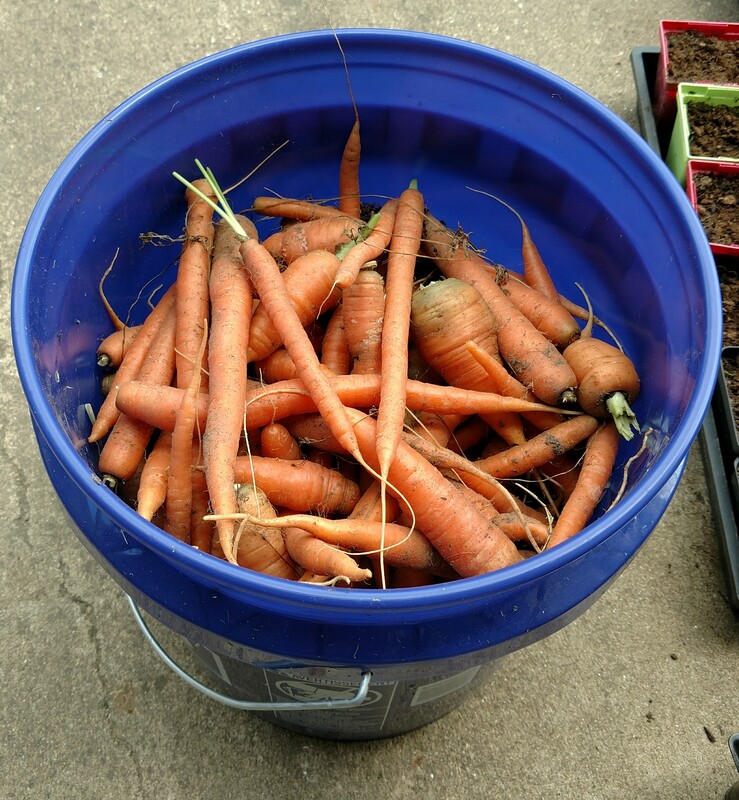 The carrots were sorted as they were picked; larger carrots were kept for the kitchen–these filled a 5-gallon bucket (that was about 1/2 of the total carrots in the ground, I had to stop because I didn’t have anything to put them in to carry back to the house). The green tops were removed and fed to the horses. The damaged or “too small” carrots were also used to treat the horses–root and greenery all together! 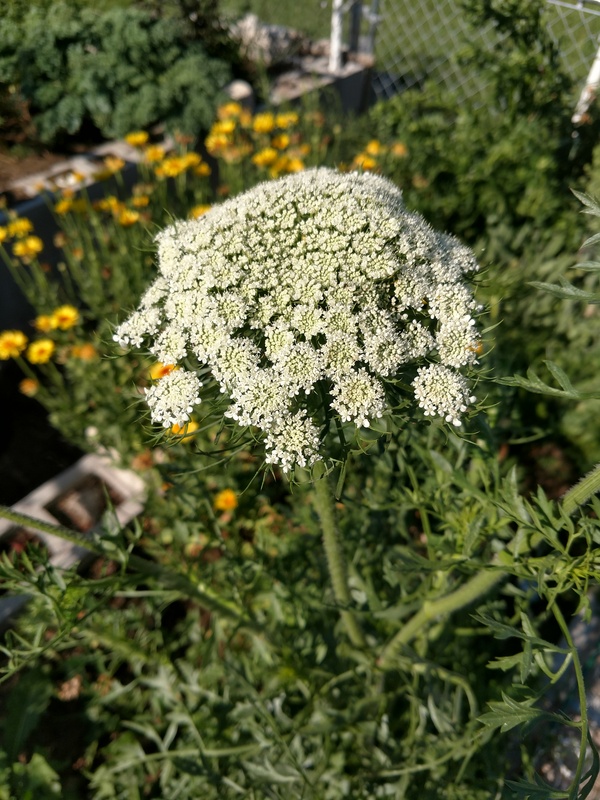 As the weather continues to warm up, some carrots will form seeds—white flowers appear in clusters, are pollinated, and then the small seeds appear. 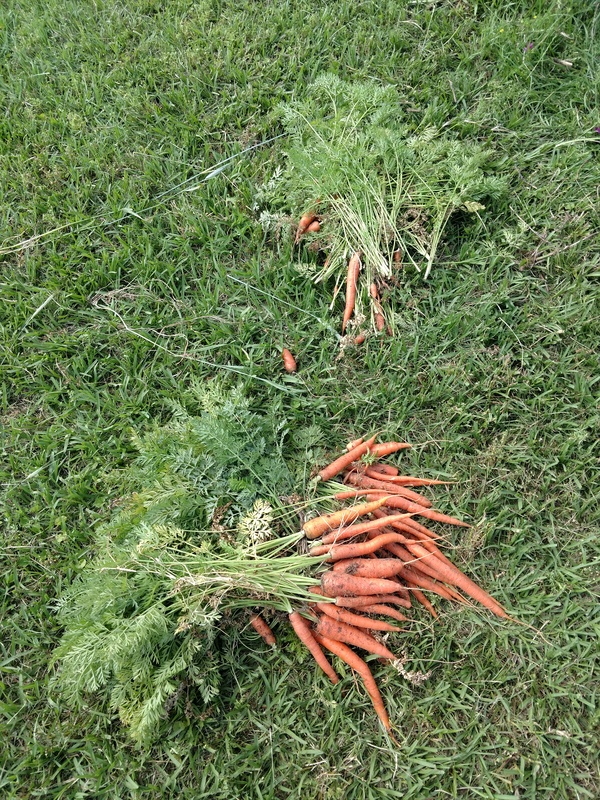 Some carrots will rot if left in the ground as the soil temperatures rise. Each time I go to the garden, I pick a few for the horses — they come and wait at the gate as soon as they see me working my way back there. Carrots sorted on the ground. For storage, Carrots may be dehydrated (slice or shred, then dehydrate using low heat, I dry them at about 90 degrees Fahrenheit) and store in a glass jar. (NOTE: carrots lose about 90% of their size during dehydration.) Dehydrated carrots can be added to soups, stews, or cooked and mashed well for young children. For optimum nutrition, however; eat carrots raw, or steamed. About half of the harvested carrots were dehydrated and the remaining were used fresh, steamed, and given to friends and family. ← Dandelions for Bees and for Soil Health!